Discussion in 'Cases & Case Modding' started by Bageland2000, Jan 23, 2019. I have a BNIB Lian Li O11 Dynamic and an Asus Crosshair 7 Hero. The motherboard is (I'm 99.9% sure) installed/seated properly in the case on standoffs. 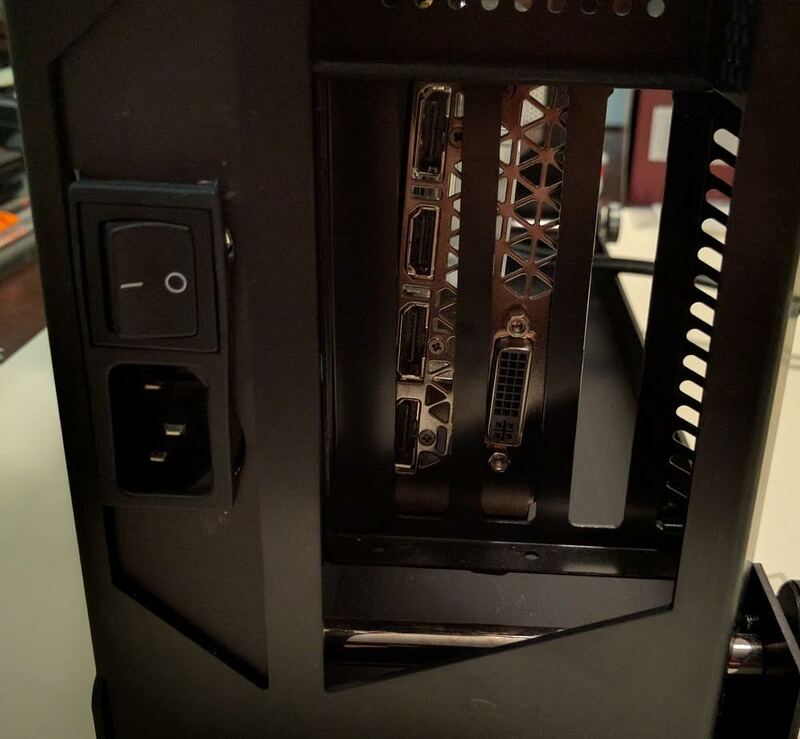 The weird thing is when I went to connect my Strix 1080Ti to the top PCI-E slot, It would hit the case (where you screw the back plate of the GPU into the case) before the card could completely seat into the mobo slot. Lower on the case, I have a sound card in a x1 slot, and the tolerance is even worse. Both cards seem to be connected enough to function, but on a brand new build it's obviously frustrating to not be able to fully push an expansion card in. This is a popular case and motherboard. Anyone else heard of or experienced this issue!? Pics? Can you move the mobo to a different set of mounting points that align better? I'd loosen the standoffs, slide the motherboard away from the edge slightly, and then tighten the screws in the standoffs. Should give you a little more room. Here's a picture. I tried to capture what is going on as best I could. I don't think that would help. The I/O plate fits perfectly in the case cutout. Shifting the mobo toward or away from the I/O cutout wouldn't change anything. The card hits the height of the case area where you screw in the card into the case first. That's why you can seat the front of the card (near the power cables) better than the back plate side. Nope. I think that raising the motherboard off the motherboard tray about a half mm would fix it, but that really isn't possible or how case/motherboard installs are designed AFAIK. Wow that's kinda surprising. Lian Li is the good stuff and I wouldn't expect any fitment issues. I've never used a Lian LI in particular but the only time I've ever had a problem with a case install was my own user error (I effed up) when installing the mobo's IO backplate into the case's rear IO hole. Had to jigger it a bit until it fit correctly and moved that extra 1-2mm that made it perfectly flush. I noticed a slight misalignment with my O11D as well (with an asus zenith board). From your picture/description mine is off in the opposite direction - the expansion slot screws are just a little too far away from the bracket on the installed cards. It hasn't been enough to cause problems for me so i've just left it as is at the moment but it's definitely frustrating. I had a similar issue, just did a little wiggling and was all set. Wiggling the mobo? Or the expansion cards? Maybe I need a second look at how well seated the motherboard is in the I/O cutout. It looks perfect, but maybe I'm missing something. I first wiggled the mobo and then the card. I've had this problem (to some degree at least) on my fractal meshify. I just don't go super tight on the screws and make sure it is seated enough so I can lock it in. Standoffs commonly used for motherboards come in a surprising number of different heights that, when combined with various motherboard PCB thicknesses, can lead to issues like this. It looks like you might need some very slightly taller standoffs. Shouldn't cause any issues with the I/O plate. Hmm, I've been building computers for 25 years, and I've never seen or heard anything about non-standard length motherboard standoffs, and I've never run into this issue. I'm pretty sure if I got longer standoffs, the I/O panel wouldn't fit in the I/O cutout of the case. Do you have a link to standoffs that are longer than normal? I wouldn't even know where to start looking. Might be worth a try to get a right-angle/square tool and verify if your case is misaligned. I haven't had a misalignment but several cases that I worked with would have the VGA outputs or connectors rub onto the pci slots. That sounds like a good idea. I'll see what I can do. Thanks! My Lian-Li PC-O5SX had a similar problem with its expansion-slots alignment. On the O5 the slots are separate from the motherboard, so motherboard alignment wasn't an issue, but the bracket where the PCIe-cable end attached. Lian-Li denied it was a problem even after I sent a photo of my GPU not fitting. Ultimately I drilled and tapped new holes in the brackets. Anyway, I don't actually have anything to add here, just that I can't say I'm real surprised to hear about alignment problems in an O11.